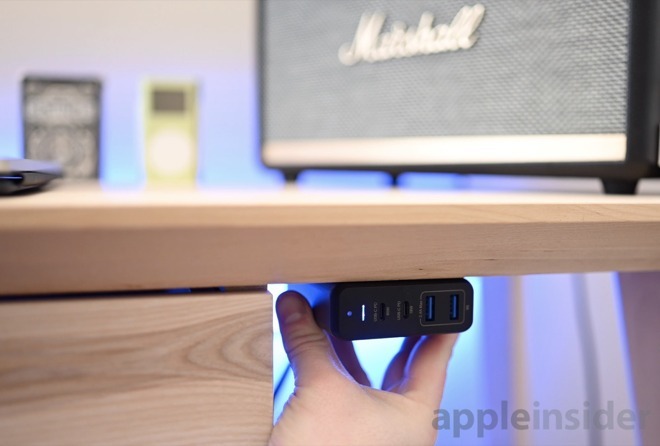 Those just add to the smorgasbord of USB-C devices we have to charge, including our Macs. While we can't charge all our USB-C devices at once, we are getting there. 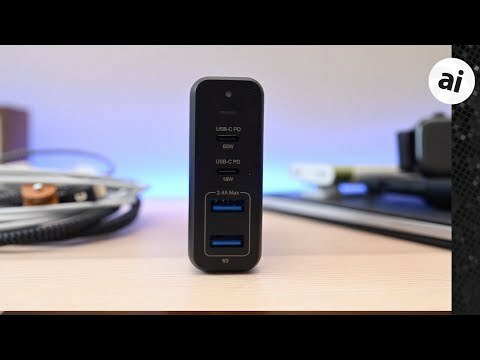 On the Satechi Dual USB-C Travel Charger, we have a 60W USB-C PD port, an 18W USB-C PD port, and two USB-A ports. A 13-inch MacBook Pro can -- at max -- take 61W of power, making this a great solution to charge even a 15-inch MacBook Pro adequately, and even keep a 15-inch MacBook Pro from draining unless you're really slamming it with work. 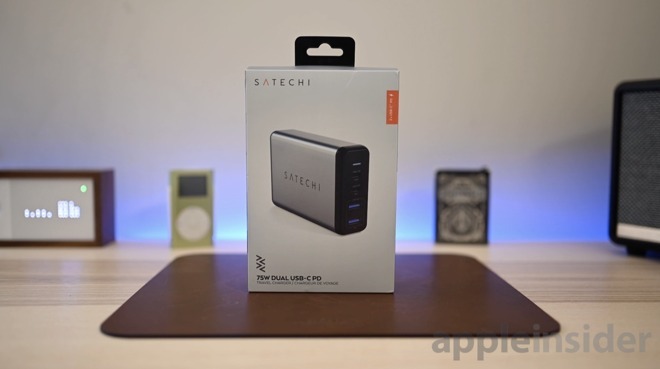 Satechi does only support a maximum of 75W, so if you have something extra power intensive -- like a MacBook Pro -- other devices will get a bit less power than the max. The power controller will intelligently distribute power based on device requirements, but it will never be more than 75W in total. We'd have preferred more USB-C ports, but the majority of people aren't quite there yet. They have a MacBook, MacBook Air, or MacBook Pro that needs charging over USB-C plus they have an iPhone they'd like to Fast Charge with a USB-C to Lightning port (for now). Or they have an iPad Pro plus an iPhone to charge with USB-C. This charger lets them do just that with some ports to spare. 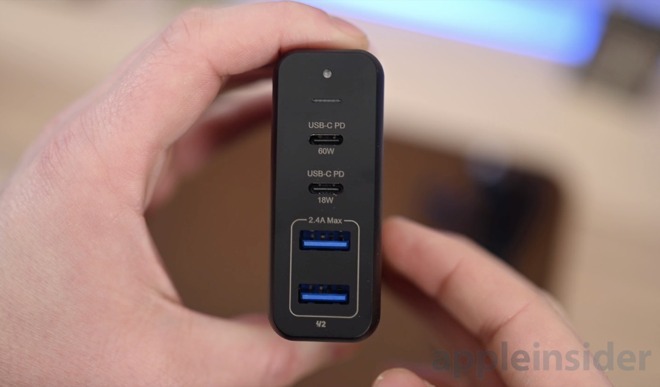 In a year or two, we may have more USB-C devices and will likely have more USB-C ports on our chargers. Until then, we've got the Satechi Dual USB-C Travel Charger to handle most of our needs in the near future. You can grab the Satechi 75W Dual USB-C Travel Charger direct from Satechi for $69.99. Looks good. The capability is reflected by price, but Satechi do deserve first mover premium as there just isn’t many chargers with this capability. Appleinsider, could you give your thoughts on heat generation a bit more?. Wondering why so many of these are limited to 60W on the most powerful port. I’d love one of these with an 85W port. The problem with all these power packs is they cut the output to 0 if you are charging the pack up! So there is no way to keep it on a solar charger to keep it topped off and try charging up your devices with the pack, at the same time!!! So what if you have one of these solar panel backpacks and you add a battery pack to it, there's no way using the the battery pack unless you disconnected from the solar panel!!! BS and very inconvenient!!! All of which might possibly have been interesting if this device were a (battery) power pack — which it isn’t. It’s a plug-in power supply. When I traveled to CES, I used an Apple USB C charger for my MacBook Pro and plugged my Apple Watch, iPad Pro and IPhone XS into the MacBook Pro’s other USB C ports (4 in total) and all my devices were fully charged in the morning. You really don’t need a multi port USB C charger. I have the single USB-C charger from Satechi. It's very nice, but it gets outrageously hot when certain things are plugged into the USB-C port. My wife's iPad Pro causes the thing to get so hot you can't touch it. Reading reviews on Amazon this apparently is typical. Because of this I don't ever have this thing plugged in when I'm asleep or not at home. Nothing should get this hot in normal operation. I had a 12" Aluminum Macbook Pro G4 that was legendarily hot and it was ice compared to this thing. Does the dual USB-C Satechi charger get hot AI?